Randy's Favorites is a collection of Randy's favorite recipes, dining adventures, and product ideas. What's better than steak? 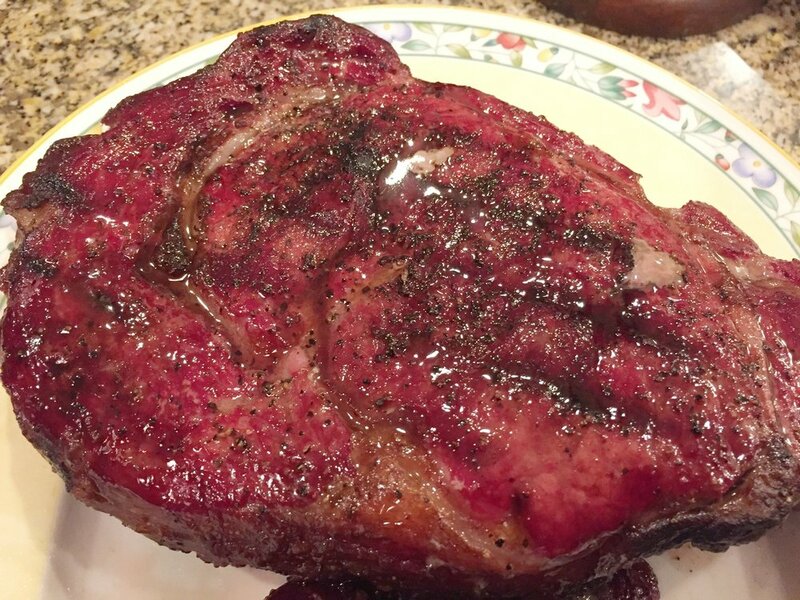 Smoked steak, with red smoke hues and delicious, bacon-like flavors. Smoked steak picks up red hues and delicious, almost bacon-like, flavors from the smoking process. UPDATE 9-23-18: Want to take the flavor even further? Try marinating the ribeyes first for at least 2 hours, using this excellent marinade from GUYCON at allrecipes.com. Skip the steps where I say to salt the meat in advance, and also where I say to put olive oil and pepper on before smoking. You don’t need all of that since you marinated the steak. Follow the rest of the steps and I think you’ll really, really enjoy the combination of the marinade with smoke - my new favorite! Yes, it’s more work - but use it when company comes over if you want to wow your guests. Most people who try this tell me it's the best steak they have every had. Obviously that's a small sample of people, but it does tell me this is very, very good. If you have a smoker, definitely give this a try. I have read a lot of articles on how to smoke the best steak. The approach below works best for me, and is quite simple. The trick is to start with cold meat and low smoker temperatures, so you get maximum smoke on the meat. The meat must also be moist for the smoke to cling to it - that's the role of the olive oil. Thicker cuts will take longer to cook, meaning you can leave them in the smoker longer for more flavor. The reverse sear technique, where you finish it off on a very hot grill, is the final touch. As for meat selection, the smoker works best on fattier cuts. 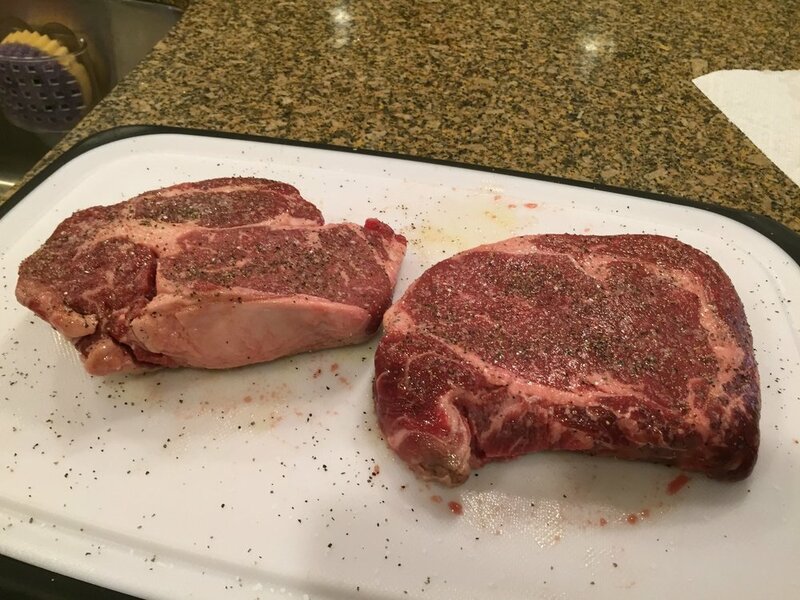 I buy ribeye, and look for steaks with a lot of marbling (thin lines of fat running through the meat). You can follow some of these cooking techniques on a traditional grill and end up with a delicious steak, but you won't be able to duplicate the smoky goodness without a smoker, sorry! Just use low or medium indirect heat, meaning lighting just one burner, or putting your charcoal on one side of the grill. Slow cook the steaks on the cooler side of the grill with the lid closed until they reach 115 internal temperature. Remove them, get part of the grill very hot, then reverse sear them as described below. You'll end up with a charred outside and evenly pink inside. This picture shows the redness, but does not do justice to the smell or the flavor. THICKER, WELL-MARBLED RIBEYE STEAKS WORK BEST FOR SMOKING. USE A FOOD THERMOMETER PROBE TO MONITOR INTERNAL TEMPERATURE WITHOUT HAVING TO OPEN THE LID (AND LOSE HEAT). THESE STEAKS WENT ON THE SMOKER AT 33 DEGREES. So you can apply kosher salt (call dry brining) and let it do its job for a few hours. So the meat can sit in the refrigerator for several hours to come to a consistent temperature throughout, meaning it should cook to a more consistent temperature throughout. Salt the meat 2 to 4 hours in advance with Kosher salt and put it in the refrigerator. 4 hours is best if you have time. Don't remove it from the refrigerator until you start the smoker - you want it going on the smoker still cold. Mine tend to be 30 - 35 degrees when I take them out of the refrigerator. Start your smoker and get it warming up to reach 150 degrees. I use pellets with a fair amount of hickory in them, which has more smoke flavor than pellets with more fruitwood. Pull the ribeyes out of the refrigerator. Wipe any salt off with paper towels. Apply olive oil to all sides, and ground pepper, rubbing it into the meat. When the smoker reaches 150 degrees, put the steaks on. Ideally use a temperature probe so you don't have to keep opening the smoke to check on them. You can use a built-in probe, like the one on my Green Mountain Grill Daniel Boone, or a dedicated thermometer such as my ThermoWorks ChefAlarm. Tip: put the probe into the center of the thinner steak, so you get maximum warning to avoid overcooking it. You can pull them off of the smoker, set the smoker to go to 500 degrees, then put them back on. I tend to use my traditional gas grill instead. It heats up faster, and avoids burning a bunch of pellets for just a few minutes of searing. Sear the steaks on both sides until they reach your desired temperature. Use high heat, leave the lid up to get more sear without cooking the inside, and flip frequently to reduce overcooking the interior of the meat. We like to pull them at 120, since they will rise to 125 while resting. That's too rare for many people, so look here for some ideas on cooking temperatures. Pulling them at 125 or 130 is a good bet for medium rare to please most guests. Cooking them to higher temperatures will (of course) reduce tenderness and flavor. After removing from the grill, put a pat of butter or margarine on them. Cover them with tented foil and let them rest for five minutes. You can see the edge to edge pinkness that comes from reverse-searing the steaks. THIS IS A COLD BITE OF LEFTOVER GRILLED STEAK THAT I COOKED RECENTLY. I'M GETTING BETTER AT THE REVERSE SEAR, AND THE RESULT IS THAT THE INSIDE OF THE STEAK IS UNIFORMLY PINK, WITH ONLY A THIN EDGE OF GRAY/SEARED MEAT ON TOP AND BOTTOM. THE SECRET TO A GOOD SEAR? HIGH HEAT, GRILL TOP UP, AND FLIPPING THE STEAK FREQUENTLY DURING THE REVERSE SEAR PHASE. Buy thick, fatty ribeye steaks. I buy USDA Choice from Costco, which are blade-tenderized*. Look for the ones that show the most marbling (fat streaks) within the meat. Some of the Choice steaks come close to what you see in the Prime steaks, which cost twice as much. Here's a primer on the difference between Choice and Prime. Fattier meats, in my experience, will pick up more smoky flavor than lean meats. The thicker the steak, the longer you can keep it on the smoker before it's done, allowing it to get more smoke flavor. * Technically blade-tenderizing has some risk of introducing bacteria from the surface into the center of the meat, where it won't get cooked enough to kill the bacteria. However, Costco has been doing this for years, and I'm unaware of a single issue. And frankly, Costco has great prices, and the steaks are more tender. A pat of butter on top adds to the overall flavor. This is a batch of medium-rare to medium ribeyes I cooked recently for some friends.